Can anyone tell me where exactly the antennas are on the dds texture files for the F27-200. I can't use the official repaint kit as I don't own a multi hundred pound graphics software package, so everything has been done via trial and error. However. I cant find where they are or even what dds they are on, although I suspect they are on one of the 3 main fuselage files. I have a very late British Midland livery to post and this is all that's holding it up. Can anyone help with the location on the texture files of the antennas? FSX East African Airlines Fokker F27-200. Here is Just Flight's Fokker F27-200 in the colors of East African Airlines; I believe that EAA once operated F27's in Kenya though I was too small to remember precisely the airline, but the aeroplane I remember vividly well as we transited bumpily between Nairobi and Mombassa. By Fabio Lagattolla. was the series 600 called QC MODE, the Quick Change (QC) concept describes the ability to convert a passenger aeroplane to a freighter and vice versa in a short space of time. I have configured as F27-300 having the same forward cargo door. Nice paints for this workhorse , keep up the good work ! This is a repaint of the Just Flight F-27 in Pacific Air Lines livery. Pacific Air Lines was a regional airline based in San Fransisco.It was founded mostly with money from investors from the Hollywood motion picture industry. Pacific began operations in 1946. It mainly flew to points in California, with Reno and Las Vegas Nevada, and Portland Oregon, being the only cities outside California that the airline flew to. In 1968 it merged into Air West. You need the payware F-27 by Just Flight. This aircraft was tested on FSX-SE & P3D v3. FSX/P3D v3 Pacific Air Lines Fokker F-27. This is a repaint of the Just Flight F27 in Pacific Air Lines livery. Pacific Air Lines was a regional airline based in San Fransisco.It was founded mostly with money from investors from the Hollywood motion picture industry. Pacific began operations in 1946. It mainly flew to points in California, with Reno and Las Vegas Nevada, and Portland Oregon, being the only cities outside California that the airline flew to. In 1968 it merged into Air West. You need the payware F-27 by Just Flight. This repaint was tested on FSX-SE and P3D v3. By Ted Giana. Textures for the payware JustFlight Fokker F-27 100/200/300. Two liveries ZK-BXA 'Kuaka' in early 60's livery ('the delivery livery') and ZK-BXB 'Kotuku' in mid-late 60's livery ('the second livery'). FSX/P3D Sterling Airways F-27-200. This is a repaint of the payware Just Flight F27-200 in Sterling Airways livery. Sterling Airways of Denmark was established in 1962 by Danish travel agency Tjaereborg. By the early 1970s Sterling was Europe's biggest charter operator carrying over 2 million passengers. In 1987 the airline celebrated its 25th anniversary with 19 aircraft and almost 1,300 staff. However, six years later, in September 1993, Sterling went bankrupt. You need the payware F-27 by JustFlight for this repaint. Textures are in DXT5. This repaint was tested on FSX-SE, but should work on P3D as well. By Ted Giana. This is a repaint of the JustFlight F-27-200 in Sterling Airways livery. Sterling Airways of Denmark was established in 1962 by Danish travel agency Tjæreborg. By the early 1970s Sterling was Europe's biggest charter operator carrying over 2 million passengers. In 1987 the airline celebrated its 25th anniversary with 19 aircraft and almost 1,300 staff. However,6 years later,in September 1993, Sterling went bankrupt. You need the payware F-27 by JustFlight for this repaint. Textures are in DXT5. This repaint was tested on FSX-SE, but should work on P3D as well. Pintura da Força Aérea Uruguaia 571, avião que caiu na Cordilheira dos Andes em 1972, o caso foi conhecido como Milagre dos Andes. Pintura para o modelo Just Flight. Pintura da VARIG para o Fokker 27 da Just Flight. Pintura da Paraense para Fokker 27 da Just Flight. 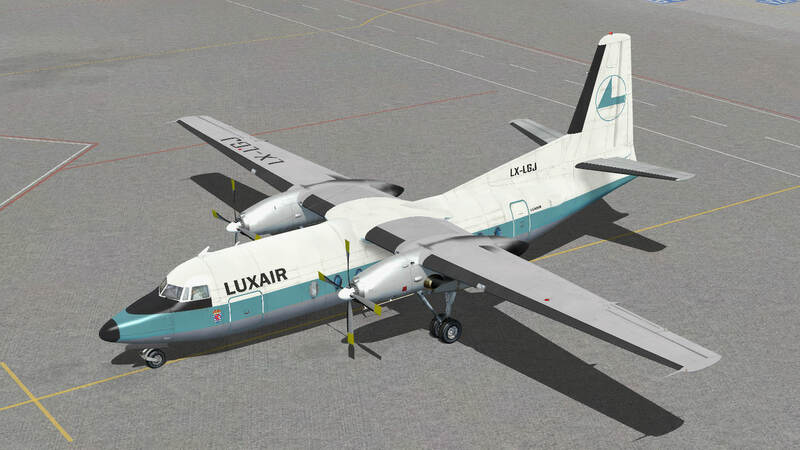 FSX Luxair Fokker Friendship F27-100. Textures only for the Just Flight Fokker F27-100 in an early Luxair livery. Repaint by Wim Demeyer. FSX Luxair Fokker Friendship F27-200. 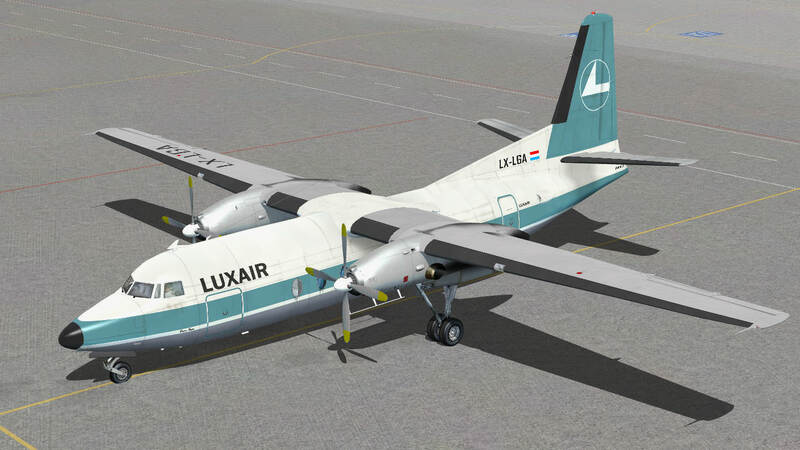 Textures only for the Just Flight Fokker F27-200 in the final Luxair livery. Repaint by Wim Demeyer. This is a repaint of the JustFlight F-27-100 in Somali Airlines colors. You need the payware F-27 by JustFlight for this repaint. Somali operated a total of 3 F-27s. Textures are in DXT5. This repaint was tested on FSX-SE, but should work on P3D v3 as well. FSX/P3D Somali Airlines Fokker F-27. This is a repaint of the JustFlight F27-100 in Somali Airlines colors. You need the payware F-27 by Just Flight for this repaint. Somali operated a total of three F-27s. Textures are in DXT5. This repaint was tested on FSX-SE, but should work on P3D v3 as well. By Ted Giana.